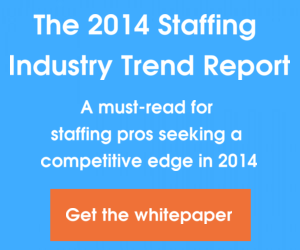 In yesterday’s article, we referenced two trends that ere.net suggested recruiters be on the lookout for in 2014. These two predicted trends were that recruiting in 2014 would look more like marketing the company brand and big data would play a larger role in helping companies make new hires. But ere.net didn’t stop there. According to them, there are two other big trends to watch out for. In the age of online recruiting, it seems counterintuitive to get personal in the recruitment process. However, that’s what job candidates will be looking for, according to ere.net. In an age when nearly all of the application and some of the interview process take place online, job seekers long for a little personal interaction. Engaging with both candidates and clients beyond technology will not only give you a better sense of what each needs and has to offer, but it will also go a long way toward building a company brand for your own firm. Rather than emailing clients and candidates, pick up the phone every once in a while to provide an update. Suggest meeting for coffee with clients so that they can get to know you better, which will lead to a more trusting relationship. When it comes to job candidates, attend career fairs and networking events to get an idea of the top talent in the various industries you represent. This kind of personal exposure, though a bit more time-consuming, will enable you to do a better job. Finally, as we move into 2014, you’ll see and hear that most companies are putting a lot of effort into making their websites mobile-friendly. Ere.net states that most job seekers next year will be searching and applying for positions via smartphone or tablet. Websites that lack this functionality will most certainly prevent job seekers from applying to positions within their company — just because of this minor inconvenience. If you don’t have plans for a mobile site in 2014, it’s time to reassess. Get a research team on the project immediately, and discuss options for actually building the mobile version. While it’s great if you have the talent and the resources to create your mobile site, you’ll also find with a bit of research that this a project that can be outsourced too. Keep in mind, also, that creating a mobile site doesn’t necessarily mean you need to build an app as well — that can probably wait, depending on the product or service you provide. With that, we’ve covered the four major recruiting trends that companies can expect to see in 2014, as reported by ere.net. Do your company a favor, and work to accommodate these trends as soon as the new year begins. Good luck! What other trends to you anticipate in recruiting in the New Year? Share now in our comments!